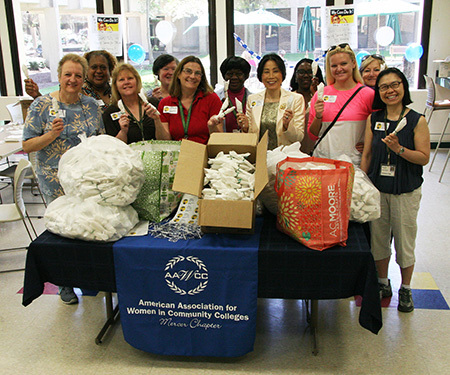 AAWCC members with the fruits of their labors, which will help TASK in its meal service to community members. Project coordinator Roseann Cooper (in red shirt) is pictured with President Jianping Wang (white jacket) and some of the volunteers. West Windsor, N.J. – Members of the Mercer County Community College (MCCC) chapter of the American Association of Women in Community Colleges (AAWCC) got rolling this spring – quite literally – as they took on a community service project for the Trenton Area Soup Kitchen (TASK). In the course of just a few hours in the college cafeteria, a group of determined women rolled up 4,000 sets of plastic utensils for use by TASK. Boxes of forks, knives and spoons were heaped onto tables and volunteers bundled them as quickly as they appeared. With music playing in the background, there was lots of good conversation and camaraderie as committee members took out time from their day to assist. What was projected to be a full day task was successfully completed before lunchtime. MCCC President Jianping Wang came by to offer her support. "It's gratifying to see our staff members giving back to the community in such a hands-on way. I applaud their efforts 100 percent," she said. According to Roseann Cooper, Manager of Registration Operations at MCCC’s Division of Lifelong Learning, who coordinated the service project, the utensil sets donated by Mercer will meet the need for a little more than a week’s worth of TASK meals. “This was an energizing and successful day and we are thrilled as members of AAWCC to make a difference in the community we serve,” Cooper said.